Spa Experience is a unique area of rest and relaxtion. Here You can find relief for your body and soul. We believe that this area is a perfect way to complement all our treatments. Spa Experience makes your visit at Sheraton Spa memorable relaxation journey. 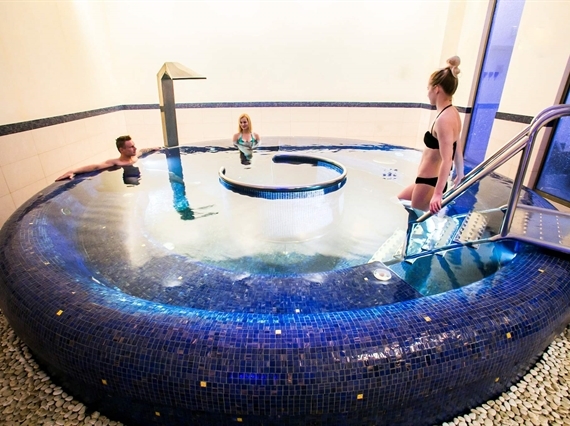 At this place, among the pools, saunas, baths and jacuzzi anyone can find a body-mind-soul balance by the deep relaxation and stress relief time. Sheraton Spa swimming pool is 12 m long x 6 m wide x 1.2 m deep. Equipped with counterflow swimming system allows you to improve your swimming technique and give way more from every minute in the swimming pool. Immerse yourself in hot water with mix of salty water from local springs and enjoy every second of it. Take a therapeutic bath to facilitate blood circulation, clean your skin, relax and relieve muscular tension to stimulate the immune system. Special jet streams can give your body underwater massage which is recommended after work out or to reduce the daily stress. Aromatic Steam Room is a part of hydrotherpay treatment. Steam with aromatic herbs and essential oils enhance therapeutic value by deep skin penetrating and purifying. Temperature in room is between 40°C - 45°C. Oasis for your lounges so take a deep breath. Salty steam is a secret relieve that is inhaled to treat respiratory problems and clean your lungs. Temperature at room is between 40°C - 45°C. Traditional Finnish Sauna is for everyone. It is a place for physical and mental cleansing. 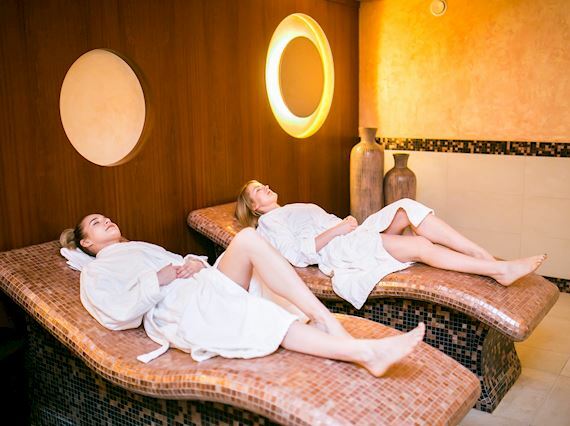 Take your own spot in sauna room where temperature rise up to 95°C and let the hot waves of steam make you feel relaxed, clean and stronger - it stimulates your immune system and keeps you healthy. Infrared sauna uses warm red light to heat your body directly without warming the air around you. Strictly recommended for people who cannot tolerate the heat of a conventional sauna. Infrared sauna shows heart-healthy, pain-reducing, life-extending, detoxifying and long-term benefits. Take advantage of ice and scrub your face and body after each sauna bath. It brings your senses back to life and refresh like a cup of good coffee. Feel the rain on your skin and let your lounges enjoy the aromatherapy. 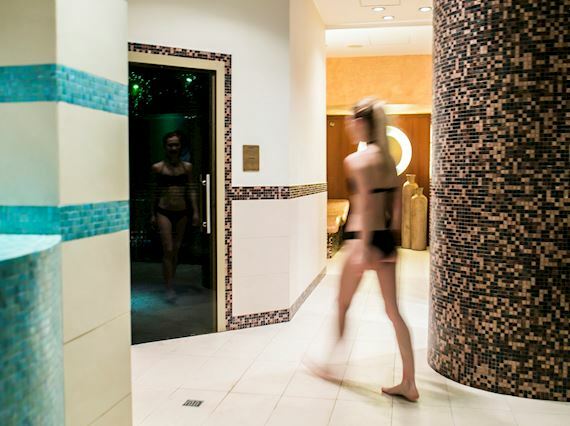 Give each of your sense a different spa experience. Relaxing area with four heated loungers is a place to visit after long day at Spa Experience. It is a last stop after all day where you can sip a cup of your favourite tea. 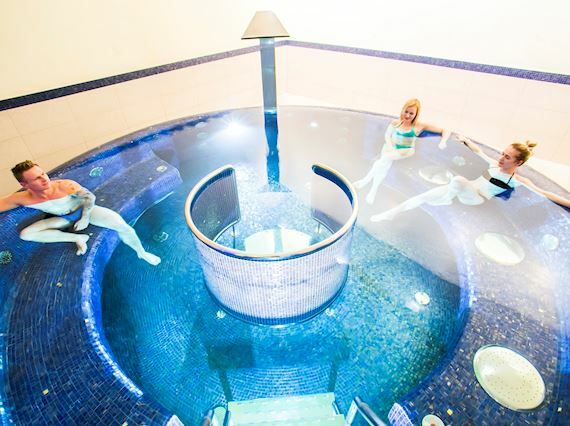 *Swimming pool is the only area available for children within the Spa. Children below age 13 must be supervised by parents/guardians all the time and can use the pool in a specified time.